Those ratings levels, down about 10 percent from Discovery Health’s levels last year, are being carefully watched by people who would like to rebuild cable channels around other celebrities, and by investors who worry that OWN is a drag on Discovery’s stock. 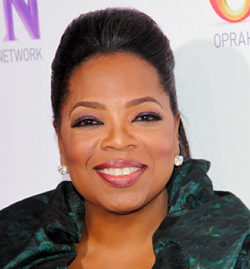 Ms. Winfrey and her partner, Discovery Communications, have preached patience, especially because she will have a minimal presence on the channel until after “The Oprah Winfrey Show” ends its remarkable run in September. Until then, OWN is nurturing shows like “Our America,” a series of documentaries hosted by Lisa Ling, which last week became the first show to be renewed by the channel. The early lesson of OWN, according to its chief executive Christina Norman, is that Oprah fans expect a lot of original programming. “We opened the store, and they cleaned us out, so now we have to restock the shelves much faster than we thought we did,” she said in an interview at the end of January. In another interview on Saturday, she emphasized that new episodes of the 12 series that have premiered so far were generally doing better than the Discovery Health programs that they replaced. But the channel is down overall because people aren’t sticking around for repeats. She said on Saturday that her goal this year remains to double Discovery Health’s ratings and accumulate 50 million to 60 million viewers each month. Nielsen said the cumulative audience for OWN was nearly 42 million people in January, up from 37 million who tuned into Discovery Health at some point in the same month last year. Three weeks after the channel’s Jan. 1 start, Ms. Norman decided to move some of the new shows scheduled for March into February, like “Breaking Down the Bars” and “Searching for…” And OWN has two more shows starting in March, “Addicted to Food” and “Home Takeover.” But it needs more. Discovery is investing an additional $50 million into OWN, on top of the $189 million that it committed before the channel came into being on Jan. 1. “The incremental funding is primarily due to increased programming investment as we continue to build long-term value in the network,” Discovery’s chief executive, David M. Zaslav, said on a conference call with analysts this month. Ms. Norman’s plan for OWN called for 600 hours worth of brand-new programs and 600 hours of acquired programs. That’s a vast amount, but then, any full-time channel has almost 9,000 hours to fill a year. But for a new channel striving for viewers, repeats are particularly uninviting. Mr. Zaslav and Ms. Winfrey have both acknowledged a problem with repeats. Of the seven shows that had their premieres in January, the stand-out was “Ask Oprah’s All-Stars,” a four-part panel discussion featuring Dr. Mehmet Oz, Dr. Phil McGraw and Suze Orman. The flop was “Your OWN Show,” a “Survivor”-style competition to groom a new talk show host for OWN. Outside prime time, “The Gayle King Show” at 10 a.m. weekdays isn’t yet drawing enough eyeballs to generate a total viewer rating, according to Nielsen, but Ms. Norman said, “Creatively, we’re very happy with the show.” It is at a disadvantage because it is not surrounded by other original shows, so it has to “self-start everyday,” she said. OWN executives say that the channel can be judged more fairly come fall when it adds a daytime talk show hosted by Rosie O’Donnell and episodes from the 25-year library of “The Oprah Winfrey Show.” Later, Ms. Winfrey is expected to have a new show two to three nights a week. Discovery said days after the start of OWN that it expected the channel to be profitable this year. Ms. Norman said that one of OWN’s other biggest challenges right now is marketing. Notably, a few weeks after OWN replaced Discovery Health, Discovery decided to more or less recreate the old channel by renaming FitTV as Discovery Fit and Health. The company has a library of health programming that is “already paid for,” Mr. Zaslav noted. What OWN uniquely has, of course, is Ms. Winfrey, one of the most-recognized and popular people in the world. The final months of her talk show are drawing more than seven million viewers a day, some of her biggest ratings in many years. And she’s priming that audience to move over to OWN on a regular basis. Last Tuesday, she devoted half of her talk show to “Our America,” the documentary series that began a week earlier. She played clips from Tuesday night’s edition, which was about transgender children; talked to Ms. Ling and two parents of a transgender child; and called the episode “fascinating” no less than four times. What did “Our America” get for all that free publicity? About 733,000 total viewers for its first showing, up 24 percent from the prior week. That was enough for OWN to order six more episodes. Those episodes, however, will not be ready until October.